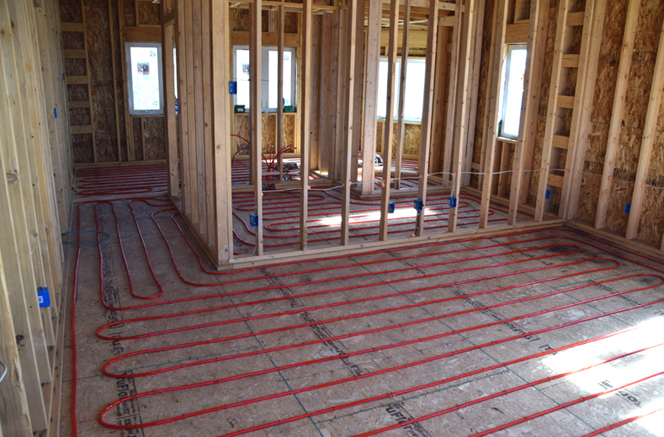 Water is the “life-blood” of hydronic heating systems. Just as we strive to maintain the health of our own circulatory systems, it’s important to maintain the “health” of water and water-based solutions that circulate through the hydronic systems we construct and maintain. The life and proper function of the mechanical components depend on it. “All the boilers used with our hydronic heating systems have warranties that include the stipulations that the water must have the right PH balance in order for the warranty to be valid,” shared Michael Willburn, President of Infloor Heating Systems. That’s because minerals in water can build up on the inside of components and reduce function levels or stop operation all together. One of the ways we achieve balanced water in our systems is with the help from HYDROFILL™ by Caleffi. HYDROFILL is a portable water treatment filling unit that produces ideal grade demineralized water from site-sourced water for use in closed loop hydronic systems. The portable water treatment filling unit removes scale forming “hard water” minerals, such as calcium and magnesium. Salts and other soluble minerals are also eliminated to prevent reduced efficiency and premature equipment failure due to scale build-up or galvanic attack. Minerals causing hardness are almost entirely eliminated. This prevents premature equipment malfunction including reduced efficiency or component failure due to lime scale formation – a common affliction of heat exchangers. Aggressive minerals like chlorides and sulfates are also eliminated, which can attack aluminum, stainless steel, and copper. Demineralized water is low in electrical conductivity to minimize corrosion due to galvanic attack. Demineralized water eliminates the variability of mineral content found in untreated site water, which provides more reliable dosing when chemical additives are used – such as glycol. In the demineralization process, the minerals responsible for producing hardness and conductivity are removed from the water through an ion exchange process. Minerals are referred to as total dissolved solids (TDS) and are measured in parts per million (ppm). The average TDS of tap water is 180 ppm. Water is considered 100% demineralized when its TDS is measured at 0 ppm, water with TDS less than 30 ppm is considered ideal for closed loop hydronic systems. HYDROFILL is a convenient tool enabling us to use the water available on-site to produce ideal grade demineralized water at an economical cost per gallon. Stop by our website News section to check out a brief video to see how HYDROFILL works. 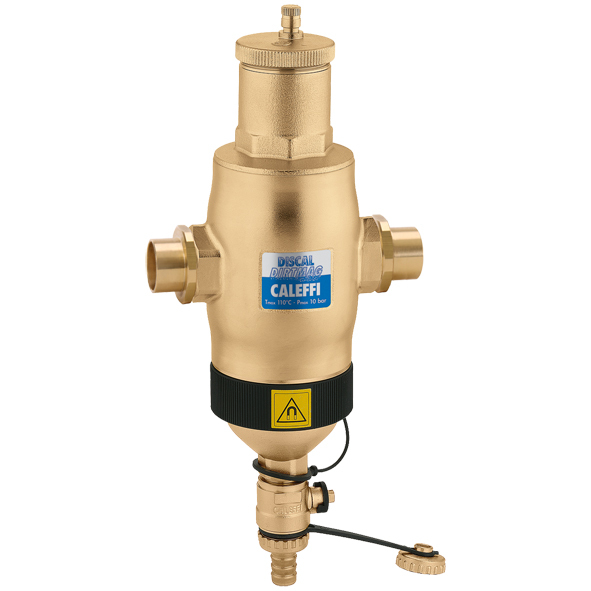 To further maintain water that is free of debris or metal, we rely on the DISCAL DIRTMAG™, also by Caleffi, to remove it. 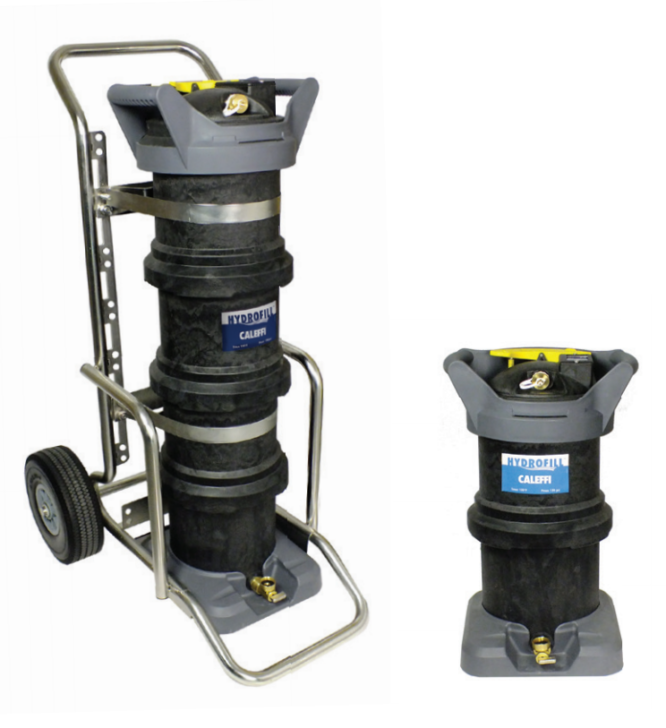 The DISCAL DIRTMAG™ air and dirt separator with magnet removes air and both ferrous and nonferrous impurities continuously with low head loss, featuring a powerful removable external rare-earth magnet around the body. The air discharge capacity is very high, removing all the air present in the system down to micro-bubble level. After multiple passages of fluid, the DISCAL DIRTMAG™ is able to separate particles down to 5µm (0.2 mil). Ferrous impurities, including magnetite, are trapped inside the large collection chamber by a strong magnetic field created by the magnetic ring positioned on the body below the flow line for fast and effective capture of up to 100% elimination efficiency and discharge through the drain valve without shutting down the system. Proper water quality will maintain the design efficiency of steel, as well as all other materials used for heat exchanging surfaces by inhibiting the formation of scale and sludge. Heat exchangers constructed of aluminum are well suited for use in condensing boiler applications because in properly maintained hydronic loops they are very resistant to corrosion. We take great care to ensure our heating systems are designed and equipped to run efficiently for decades to come. Maintaining high standards in everything we do brings you the best quality possible. Please contact us to learn more or to get started.